Amid reports of a still-sputtering U.S. economy, many of the nation’s “agbioscience” industries are providing significant and positive economic effects, especially in the southern region of the United States. The study also indicates that subsequent related industrial activity adds another $1 trillion in output and nearly 4.6 million jobs with a labor income totaling more than $200 billion in the South. According to the Battelle study, the tremendous economic impact is due in large part to modern scientific and technological advances and innovations developed and made available to the public by the region’s land-grant universities, especially their Cooperative Extension Service and Agricultural Experiment Station components. “OSU and the division have always been committed to land-grant research and Extension partnerships, which have a renowned history of contributing not only to agricultural industries but many additional industries throughout Oklahoma, the region and the world,” Woods said. The division’s two state agencies - the Oklahoma Cooperative Extension Service (OCES) and the Oklahoma Agricultural Experiment Station system (OAES) - directly and indirectly affect the state economy in a number of ways. For example, the agencies employ more than 3,000 people who add $7.7 million to local and state coffers annually. Furthermore, division research and Extension efforts support Oklahoma endeavors in every part of the state. Eighty percent of the state’s land is used for agriculture, and the industry provides approximately 188,000 jobs and pumps an estimated $28 billion into the state economy each year. Battelle gives special accolades to OSU’s research and Extension innovations for dual-purpose wheat management. Oklahoma producers plant about 5.7 million acres of wheat annually, of which 2.5 million acres are also used for livestock grazing during fall and winter months. 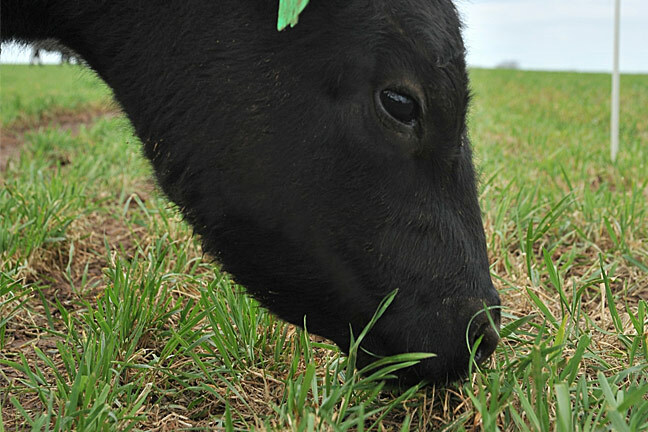 “By removing cattle from wheat pasture right after the plants reach their ‘first hollow stem’ level of development, the pasture is able to recover from being grazed and provide a crop harvest in June with no significant yield loss, allowing producers to generate income from both the sale of cattle and wheat,” said Jonathan Edelson, OAES interim associate director. Also receiving special recognition in the study was industry assistance provided by the division’s Robert M. Kerr Food and Agricultural Products Center. Simon Tripp, a co-author of the Battelle report, classified “agbiosciences” as a dynamic sector that leverages sustainable biobased resources to produce goods and services that meet large-scale market needs. The Battelle study contends the land-grant system is “on the frontline” of sustaining and securing U.S. competitiveness in strategic economic opportunities related to the agricultural and biological sciences. The full report is available for viewing at http://www.lsuagcenter.com/en/administration/about_us/chancellors_office/agbioscience/index.htm via the Internet. Headquartered in Columbus, Ohio, Battelle is the world’s largest independent research and development organization. It is also one of the nation’s leading charitable trusts, focusing on societal and economic impacts while actively supporting and promoting science, technology, engineering and mathematics (STEM) education.